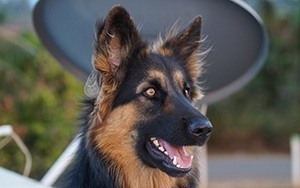 Despite their large and intimidating size, German Shepherds are known for their friendly demeanor and intense loyalty. In fact, these traits make them one of the most popular dog breeds in the world. 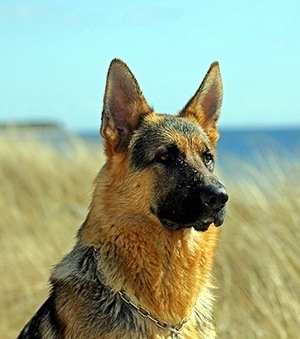 German Shepherds are also incredibly smart, making them great workers and companions alike. They train easily and have a body built for constant activity. With all that muscle and body mass comes an insatiable appetite. To maintain good mental and physical health throughout their lives, German Shepherds need a healthy and fulfilling diet. With a wide variety of dog food options on the market, it's good to know what to look for and what to avoid when shopping for your German Shepherd. How Much Food Does a German Shepherd Need? With their large size and active lifestyle, you can expect to feed a German Shepherd a considerable amount of food each day. The exact amount of food will depend on a number of factors. It's important to monitor their activity level and weight to ensure that you're supplying your pup with just the right amount of food to stay healthy. You should also pay attention to the caloric value of the food. Regardless of the brand, it's important that you measure food based on calories instead of volume. Typically, an adult German Shepherd weighs around 70 pounds. To maintain this weight with adequate exercise, your dog would need approximately 1,600 calories of food per day. If your dog is more active than normal or works throughout the day, you'll need to increase their caloric intake. On the higher end of the spectrum, active working dogs will need around 2,100 calories. Once your dog hits their senior years, you'll need to adjust their intake once again. This also applies to dogs of any age that don't exercise much or those that lose their energy after neutering. If you supply a less active dog with too much food, it'll lead to weight gain and other potentially dangerous health concerns. Older and less active dogs should be fed around 1,200 calories each day. 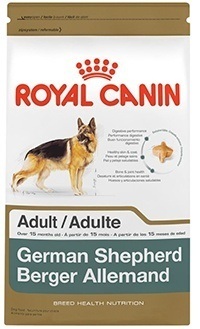 Formulated specifically for German Shepherds, this dog food contains ingredients that can tackle common health issues. It's enriched with Omega fatty acids EPA and DHA to help keep your dog's skin and coat healthy. To tackle joint issues, the formula also includes glucosamine and chondroitin. The main protein source is chicken by-product meal. There's also a high level of fiber to support the breed's sensitive digestive tract. These include brown rice, oats, peas, and much more. There's also natural chicken fat for energy and host of vitamins to ensure that your pooch stays healthy. The kibble has a hard texture to promote chewing. Also a breed-specific option,this food contains a high level of protein at 23% to help promote strong muscles. It contains chicken and fish meal as its main source. There's also chicken fat and fish oil. The fish oil is preserved with a natural alternative and contains a healthy dose of fatty acids to improve your dog's coat. Fibrous ingredients like whole grain sorghum, beet pulp, and brewers rice, help to keep the digestive system in check. 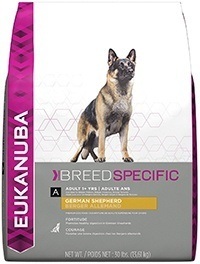 The dog food also utilizes Eukanuba's unique 3D Dentadefense system. It helps to clean the teeth as the dog chews and reduce tartar build up over time. 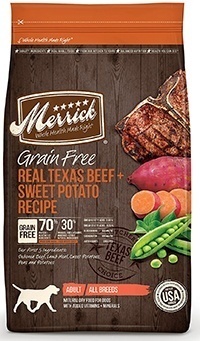 With 38% protein, this grain-free dog food from Merrick is a great option for German Shepherds. It's available in a variety of different flavor options and utilizes high-quality protein sources. The "Texas Beef" flavor uses lamb meal, deboned beef, and deboned salmon for protein. For fat, the manufacturers went with flaxseed oil and salmon oil for a total of 15%. This gives your dog a boost of omega fatty acids. There are also apples and blueberries to provide vitamins, nutrients, minerals, and antioxidants. In terms of carbohydrates, the formula contains complex variants like sweet potatoes and peas. There's also organic alfalfa to introduce extra fiber. If you're looking for a healthy wet option, this dehydrated dog food may be the way to go. Simply add warm water to give your pooch a nutritious and delicious meal. The formula is free of GMOs, preservatives, and byproducts. It contains 22% protein and utilizes hormone-free beef as the main source. For digestion, the formula contains barley, oats, and flaxseed, There's also carrots, eggs, apples, cranberries, and much more. The manufacturers utilized organic whole ingredients throughout. It's made to provide a balanced diet that's free of unnecessary fillers. There's minimal processing to the food and it's even fit for human consumption. 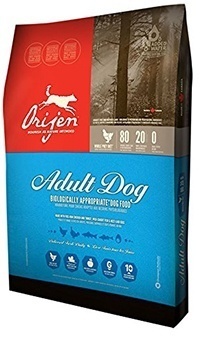 From Orijen, this food is designed to cater to the biological needs of a dog. It contains 38% protein while limiting unnecessary extras. The formula consists of only 19% carbohydrates, 15% fruits and vegetables, and absolutely no grains. For protein, it uses fresh chicken meat, duck meat, whole eggs, chicken liver, herring, flounder, turkey liver, mackerel, sardines, and much more. There's also a small collection of fresh vegetables and fruits to provide additional benefits like antioxidants and vitamins. As a whole, the food is designed around the dog's need for whole protein. 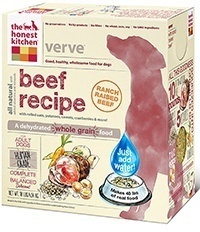 It even contains freeze-dried livers to make the food appetizing to even the fussiest pooch. With their large bodies and penchant for exercise, German Shepherds need to eat dog food that's nutritious and full of protein. Pay attention to the ingredients list and look out for the following ingredients to ensure that your dog has the fuel to thrive. A high-quality protein source should always be the first thing listed on an ingredient's list. Dogs are carnivores by nature and need protein﻿ to build muscles. This is especially true with an active breed like German Shepherds. They need to consume high levels of proteins and amino acids to keep their strong muscles in good condition. On average, an adult German Shepherd will need food that's made up of at least 18% protein. Younger pups will need food that has 22% percent to ensure that their bodies develop properly. As a rule of thumb, stick with higher levels of protein. Look out for quality sources of protein. Not all foods are made the same. Many cheaper foods consist of unspecified meats. These sources don't contain the same levels of protein and amino acids your pup needs. Instead, go for whole meats that you can easily identify. These include chicken, lamb, duck, bison, and much more. You can also go with meat meals, as long as the specific type of meat is identified. For example, "chicken meal" is a good ingredient because it refers to ground up chicken. However, "meat meal" is not because it doesn't specify what type of meat is included. 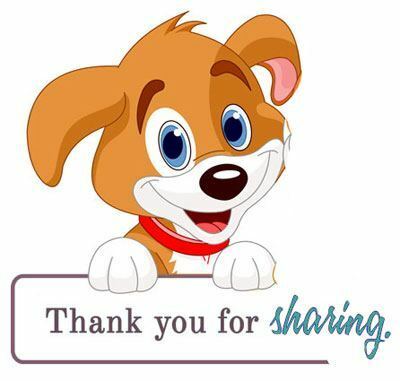 Carbohydrates are found in every dog food. They act as a filler and can provide energy throughout the day. With that being said, some carbohydrate sources are better than others. 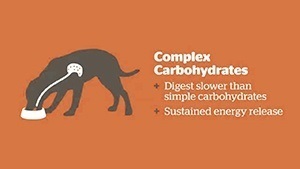 High-quality complex carbohydrates are a great addition to your dog's food. These include sweet potatoes, carrots, beans, and many more fruits and vegetables. These differ from simple carbohydrates because they burn slowly throughout the day. They can help to keep your furry friend energized and avoid that unwanted energy crash. Fat is a great ingredient that can be beneficial in terms of energy and appearance. Furthermore, fat can make the dog food much more enticing to dogs. On average, an adult German Shepherd should be eating a food that consists of 5% fat while a puppy can benefit from upwards of 8%. Healthy fats can energize your dog and nourish their skin and coat. However, it's important to pay attention to the specific source of the fat. The best sources are pure animal fat from the protein source, fish oil, and flaxseed oil. Animal fat is typically the tastiest while the latter options are sources of Omega-3 and Omega-6 fatty acids. These fatty acids can help to keep the skin flake-free and nourished while making the fur shiny and soft. Fiber is a very beneficial ingredient that can come from numerous sources. It can come from leafy greens, apples, oats, and much more. The added fiber helps food move through your dog's digestive tract much more easily. German Shepherds have a shorter colon than dogs of the same size. With plenty of fiber in their diet, you can minimize the chances of digestive issues and help ensure that nutrients are being absorbed properly. When scouring the market for that perfect dog food for your German Shepherd, there are a few ingredients you should avoid. The following ingredient options are often used in cheaper dog foods and do more harm than good in the long run. Corn and soy are cheap and abundant. As a result, they're thrown into food to fill up your dog and keep the costs down. Unfortunately, they can cause significant stomach issues. German Shepherds already have a sensitive digestive tract, so throwing these ingredients into the mix can wreak havoc on your dog's body. They're known to make dogs lethargic and constipated. They can also lead to a host of issues in the future if fed to your dog throughout their life. Nuts should be avoided because they're known to cause hair loss in dogs. This issue is more prominent with German Shepherds. Continued consumption can lead to noticeable patchiness and increased shedding. The ingredient has a significant amount of salt, which can lead to a number of additional problems. There are a number of natural options that do the job better and are more healthy for your dog. For preservatives, natural options include Vitamin E, Vitamin C, and Tocopherols. As for flavoring, go with an option that uses natural fat instead of a manufactured additive. While some dogs fair well with a single large meal at the end of the day, it's not recommended for German Shepherds. The breed is known for having a sensitive digestive tract. They're susceptible to excessive bloating. To avoid this, you should break your dog's daily food into smaller meals. At the very least, they should be fed twice a day. This will make digestion easier and can help prevent bloating. Food often comes in both wet and dry forms to accommodate different preferences and concerns. For German Shepherds, it's often recommended that you stick with dry food throughout most of the dog's life. This is because dry food has more nutritional density. It consists of roughly 10% water whereas wet canned food can contain up to 75% water. Due to their high calorie requirements, dry food presents a higher value and is more economical. With wet food, you'd have to feed your dog more food to make up the difference in nutritional content. With that being said, wet food can be fed to your pooch occasionally for an extra treat or to dogs that are suffering dental issues. There are a few health concerns you should be wary of. They're common to the breed and often occur as the dog ages. Many issues can be managed with a healthy diet. This is common among any large dog breed. Because of their large size and constant activity, a lot of stress is put on their joints. As they age, Displaysia can cause immense pain as they walk. While it can't be avoided completely, you can take the steps to promote good joint health early on in their lives. Glucosamine and chondroitin are supplements that are often added to foods. They help to keep the joints and ligaments soft to absorb shock. They're often included in dog foods made for seniors and those with a "Joint Health" label. Gastric Torsion occurs when a dog eats too much or starts exercising right after they've eaten. As the body moves, the stomach twists and prevents gasses from traveling through the body. While it may sound more of a nuisance than anything else, it can be pretty dangerous. It's not only uncomfortable, but it can be fatal in some cases. To avoid it, you should separate your dog's meals into smaller portions and make them relax for at least an hour after eating.